Brian Carney has lashed out following Gabe Hamlin's suspension - and branded some of Wigan's players "absolutely disgraceful". Aussie prop Hamlin has returned home after being charged with a UK Anti-Doping violation. 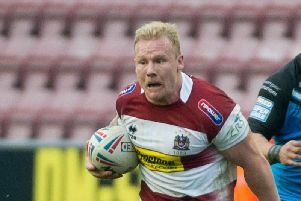 His suspension came a week after fringe first-teamer Craig Mullen was charged with drink-driving. And former Warriors crowd-pleaser Carney had a strong message to the current Wigan players during a hard-hitting interview with Sky Sports News. "We have had Zak Hardaker pre-season on a drink driving charge, Craig Mullen in recent weeks on drink driving and now we've got a UK anti doping agency violation by Gabe Hamlin. "You are not the club. The people who go every week are the club. You are letting yourself, your fellow players and the supporters and Kris Radlinski and Ian Lenagan down.